January 30, 2010 - I traded in our 2000 F250 and 2002 Durango on this 2006 F150. We don't really need three vehicles, nor do we really have a need for an SUV. I do like having a truck, and do need something to pull the boat, but the F250 isn't comfortable enough to drive all the time. It has a manual transmission which Connie isn't inclined to drive should she have to drive the truck. She also wanted to have a 4x4 so that she knows she can get in and out of our driveway regardless of how much snow we might have. So it made sense to have the Pontiac Gran Prix for her to drive predominantly and a more comfortable 4x4 truck for me to drive predominantly. So we consolidated. We haven't called the insurance man yet, but it should save us some money on insurance. And the F150 gets better mileage than the Durango so maybe a little savings there. 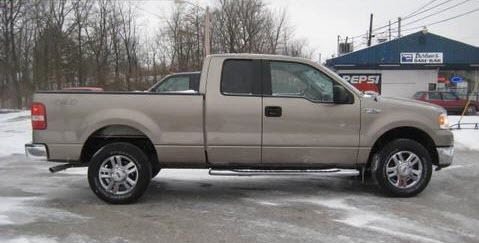 Interestingly, I got more for the 2000 F250 ($8500) than I did for the 2002 Durango ($5500). The Durango was in much better shape too. We paid $32,000 for the Durango in 2002 and $14,000 for the F250 in Jan, 2004. So you can see that that old diesel truck was a pretty good value, compared to the Durango anyway. Why I didn't consider GM or Dodge trucks. I spent an hour or so getting the new tonneau cover on my truck. Its from Xtang. I had a heck of a time getting the canvas to snap onto the rails. I had to pound on the edges to get them to snap into the grooves in the rails. I had a LeBra cover on my F250 and it went on easy even in very cold weather (like 20F). Hopefully this one will get easy after its been on the truck for a while. I do like the toggle on tailgate bar. Much easier than having to unscrew the old one. I just hope the snaps hold up. I also like the spring loaded cross bars. Those make for cleaner fit than what LeBra had. Also, the side rail clamps are better with the Xtang. The next thing is to make a wooden brace system that will support the cross members during the winter when they might get a heavy snow load while the truck is parked outside. The F250 sat out in a heavy Spring snow not long after I got it and bent the cross rails. My dad made some new ones out of wood, but they were never quite the same. So hopefully a bracing system will prevent that. I'm still working on the design, but I want to have it done in the next week. Wow that truck is dirty! - We've had lots of snow this winter. - I had the rust on the right reaf fender repaired. - I replace the rear brake shoes in the process of freeing up the emergency brake actuators lever in the backing plate. The emergency brakes work now. October 8, 2014 - Latest pic of the truck, now with 90,000+ miles on it. I busted the right side rear-view mirror. I bought a new mirror (actually both sides). The new mirrors have electric fold in, and I thought it would be nice to add that function. So I bought some wire etc. to add the function. I've now discovered that finding the pins I need to had to the electrical connector are going to cost about $70, so at this point (now January 2016) I've not gotten the electrical stuff done, and the mirror has a piece of tape on the pivot joint to hold it from folding in. I can't find one of these trucks in a junkyard so that I could get the connector. It's been an adventure! Replaced the right tie rod end and had the front end realigned. On the way home from Akron, the front end shuddered like crazy when I applied the brakes. Found that the right tie rod end was pretty shot. Replaced the differential lube and the differential cover - when I start up from a dead stop, with the wheels turned, the rear end shudders. Changing the lube might help the problem. We'll see.